“Promise” singer Ciara took a break from recording her new album to take Baby Future shopping for some new ‘fits. 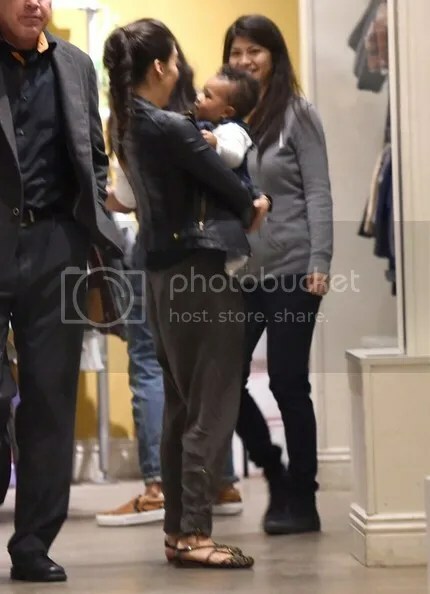 Mommy and baby strolled through Bel-Bambini in West Hollywood yesterday, where almost-6-months old Future Jr looked adorable in a denim outfit and socks. Looks like he’s already quite the charmer with the ladies. Cici kept it cute and casual, sporting some overalls, some slip-on sneakers, and our favorite accessory, the colorful baby entertainment. Six months old, already? Jeez, time flies. Never mind the fact that Ciara doesn’t look like she ever gave birth, let alone 6 months ago. Looking forward to seeing those new outfits on Instagram soon, Cici!